Remember the housecoat? I’ll remind you. Here’s the before (which, in the tradition of all ‘before’ pictures has been taken in poor light with the subject looking frumpy and sad). Cue happy tinkly music for the big reveal! Well, sort of. I’m only half-convinced about this one. I’m still viewing it with caution. It still looks…. housecoaty. 2. Chopped off bodice at waist level after humming and hawing about putting in a waistband. 4. Made waistband using another bodice pattern: sewed darts then cut band, which ensures you get the right curve. Had to make band narrower than I would have liked because I was left with not much fabric to work with due to poor cutting (see 3.). 5. Trimmed bodice. Gathered under bust. Attached waistband. 7. Gathered skirt top, attached to waistband. 8. 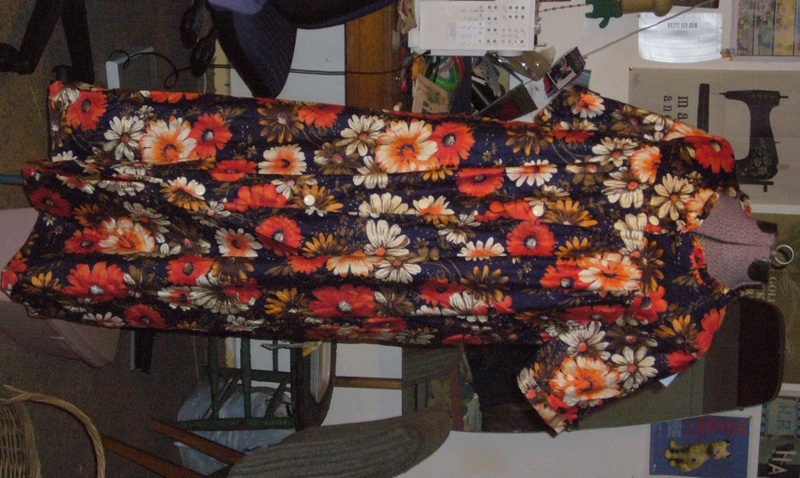 Shortened sleeves and reattached. 9. Added new buttonholes and buttons. Closed up one of the old buttonholes that was now in the wrong place (can you see in pic below?) Mended bits where buttons had torn fabric. 10. 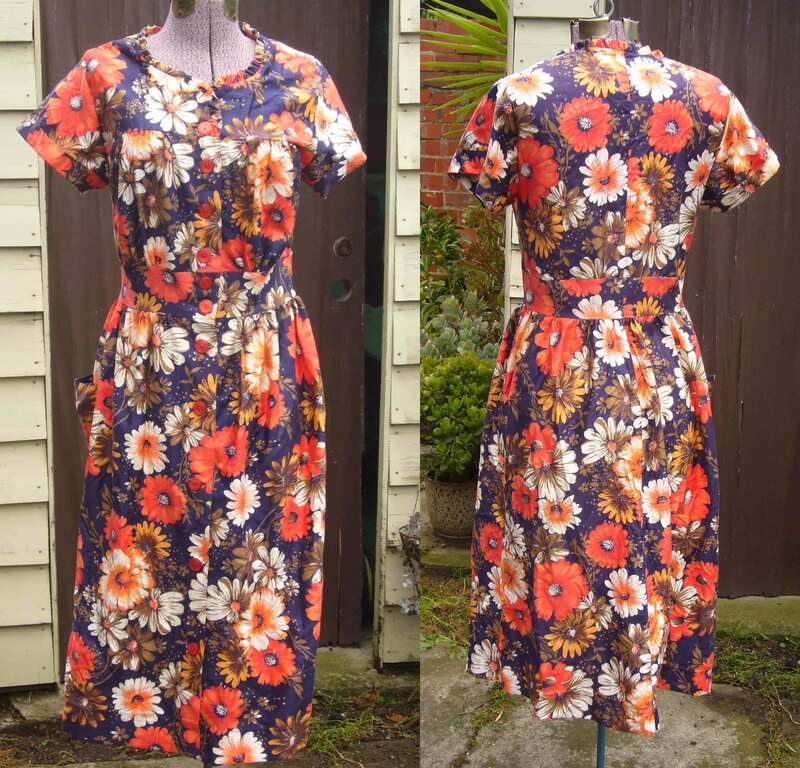 Hemmed it and thought about how it probably took longer than making something from scratch and how it still looked like a nanna frock. Now, where are my ugg boots, dearie? Why, why, why? 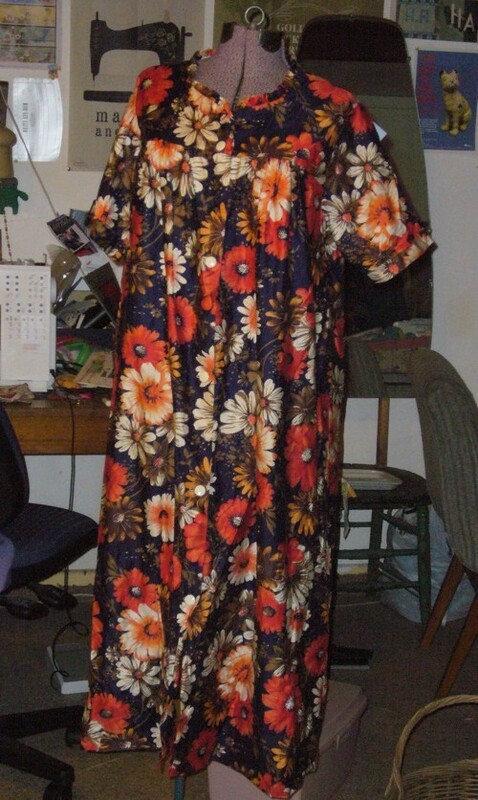 Why is she showing you an ugly muumuu of a housecoat? Because she bought it for $9 at the op shop. 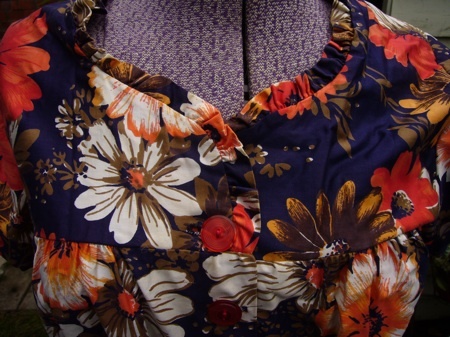 Because the fabric is a thick polished cotton in one of her favourite colour combos… dirty royal blue and poppy red. Because she’s made the effort to capture a ‘before’ picture in the hours before a dazzling reworking of this monster into something cool. Well, at least it won’t be bejewelled with maggots.